I'm in my early 30s, work in London and spend most of my spare time visiting friends and family and generally eating (and drinking) what I want. Despite this, I have always enjoyed exercising and generally found that I could shake off any excess weight fairly quickly. But for the few months in the run up to starting the programme, I started to feel fatigued with my gym routine. I had lost my passion for running and I started to gradually stop exercising. In turn I also started feeling flippant about my diet. It started in December when my socialising turned up a notch and In January (when everyone decides to 'be healthy') I just continued my destructive phase of eating what I wanted, when I wanted and maybe doing a token gym class if I felt like it. Three months later when my skinny jeans wouldn't close, I decided I had to do something to get my passion for exercise back and my eating habits under control. I'm now at the end of the 8 weeks and I have loved every minute! Lorna's guided exercises have helped motivate and encouraged me to be outdoors when exercising. I have been enjoying mixing things up by doing some of my intervals and bootcamps at the gym with cardio sessions outside. The structure has also lent to me being able to fit this into my working day as I can do this anywhere. The daily articles have always stuck a chord with me and having 24/7 access to the members area means I have been able to go back and re-read some of them on days where I am lacking motivation. But the best part of the programme by far has been the endless support and encouragement from Lorna. The daily, personalised feedback on my food choices has kept me on the straight and narrow. Every morning I enjoy reading Lorna's comments and making sure I make little tweaks the next time I make the recipe. I've loved that this hasn't been a set menu or calorie counting diet. I am simply switching up my food choices for more healthy ones. The main thing I have learned so far is that it this isn't about having an 'all or nothing' attitude and I need to make sure I find ways to make the right food choices fit around my lifestyle. I'm so proud of the progress I have made but I know that this doesn't end now - it's something I plan to continue forever. I have learnt that scales only tell part of the story. I lost 3lbs in the 8 weeks however the difference in body shape is amazing. I lost over 5 inches around my tummy and I have built muscle and become so much more toned. I can fit into my skinny jeans with ease and am now a comfortable size 12. Fitness wise I have smashed all my goals. I can't wait to keep going and see what the next 8 weeks will hold! I think my advice would be that it's a marathon not a sprint. There will be days when it's hard and temptation is too much but as long as you stick with the principles overall then you will achieve your goals. Also remember that scales are only part of the story. 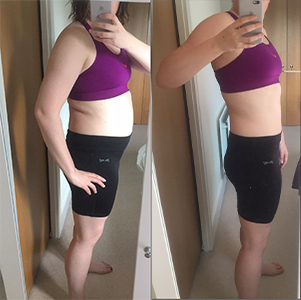 Before and after pictures and measurements are a much better way of seeing progress. Were you inspired by Denise's story? If so why not start your own journey?